I know, I know, I know. I usually save the beer reviews for September through the entire holiday season but seeing how I am trying to fill up content for the new multimedia website, Veggiemacabre.tv, I figured I should stick to my roots. 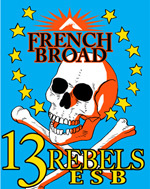 So tonight I am reviewing a local brew from North Carolina, French Broad’s 13 Rebels E.S.B.. I liked it and even though it is light on the bitters units (IBU) and only 5.2% alcohol by volume, it holds up in light body and flavor. Please watch and enjoy. And even enjoy the racist ashtray at the beginning. boosting the immune system and reduction of blood plasma cholesterol level.